I considered titling this post, “How I get my family to eat leftovers”. I enjoy trying new recipes. Even those rare *cough* times that the results aren’t especially tasty, we can usually manage to choke down the initial round. Getting someone to consume the leftovers, however, can be a challenge. I recently made several dud slow cooker meals that I managed to salvage into meals that were actually quite good. I’ll start with the easy ones. My first experiment was a recipe for Italian Beef. It was basically beef, seasonings, onion, and bell pepper. 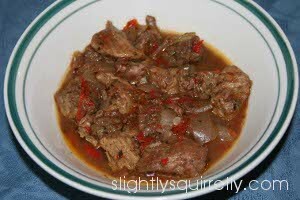 The problem was the onions and peppers cooked away to nothing so it was pretty much just meat and thin sauce. The recovery on this one was easy and didn’t wait until the leftovers round. 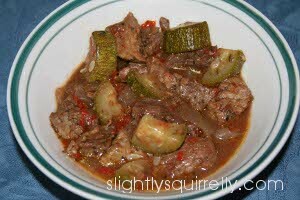 I chopped up some zucchini, sautéed it, and dumped it in with the beef shortly before serving. I chose to serve it over rotini (not shown) rather than the suggested couscous to give it some bulk. This illustrates the first two tips, Tip 1 Add an ingredient to change the flavor and Tip 2 Add an ingredient to change the texture. 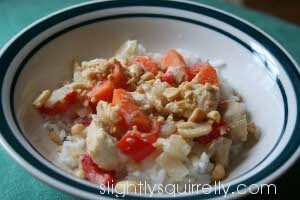 In that same vein, I made a Thai Peanut Chicken dish that wasn’t especially flavorful. Adding chopped peanuts to the top gave the dish a little crunch and a some more peanut flavor. Sadly, I do not have a picture of the French Dip I turned into stroganoff. It was so good, we inhaled it more or less. The original dish was mostly sliced Portobello mushrooms, onions, and hunks of beef. It was meant to serve in rolls and dip in the broth. The texture came out all wrong. The meat hadn’t fallen apart properly and the large slices of mushroom were off-putting. The food processor came to my rescue. I ran the solids and a little of the broth through the food processor to make a mixture similar in consistency to chicken salad (without the mayo). I served it over noodles with a dollop of sour cream. It was delicious. Tip 3 Process the dish to change the texture. The Lamb Stew I made was a big disappointment. Like the French Dip, the meat didn’t cook down properly. Inspired by the stroganoff success, I pulled out the food processor again. 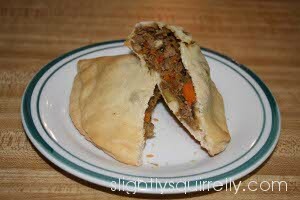 The meat and some of the vegetables were chopped up and became the stuffing for pasties. The pasties were served with a small bowl of the broth for dipping. The rest of the vegetables were chopped more finely and put into meatballs. Tip 4: Turn it into an ingredient for a different dish. 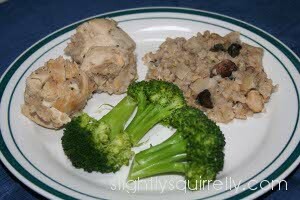 The Chicken and Brown Rice dish was another illustration of Tip 4. It was rather blah originally so the leftovers became a tasty soup. I diced up the chicken and broccoli into smaller pieces and threw them, the rice, and some frozen mixed vegetables into some broth with a little salt and cayenne pepper to taste. I hate wasting food so I was quite pleased to be able to turn these disappointing meals into food that everyone enjoyed. Fresh ginger, lemon, lime, salt, pepper, or even cayenne pepper (sparingly) can give a little zing to your dish without cranking up the heat. A cheese like mozzarella can be used to mellow a spicy dish while a cheese like feta or parmesan can add a tang. A dollop of sour cream can work wonders. Nuts, chips, and crackers can add some crunch to a meal. A tender crisp vegetable can also give it some tooth. Broth, milk, water, etc. will thin out a thick sauce while corn starch or flour will thicken it. If the meal is served over/with a starch, that choice (couscous, rice, type of pasta, potato, etc.) can make a difference in the texture of the dish. One of the reasons so many different shapes of pasta exist is because each brings a unique texture to the meal. Using a knife, food processor or immersion blender on all or part of a dish can totally transform it. Rice dishes can be cooked down into soup thickeners. 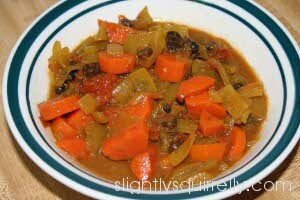 Vegetable dishes can be pureed and made into vegetable stock. Vegetables dishes can be finely diced and added to meatloaf/meatballs or pasta sauce recipes. Meats can be cleaned of their sauces and used in casseroles or soups. 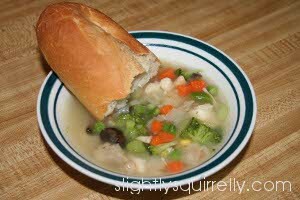 This entry was posted in Food and tagged crock pot, food, improving texture, ingredients, leftovers, slow cooker. Bookmark the permalink. I love this! I’m going to keep these tips in mind… I can think of a couple of times I threw food out when I probably could have created something different from it. Thanks for the ideas!! Good day and welcome to my blog . I’m Klaudia Cooper.